And there it was, the prettiest, shiniest and sleekest vacuum I’ve ever laid eyes on…and it was light and cordless. It really was life changing in the smallest but best way! I used that thing ever single day when I lived with my parents. They kept it charging in one of the lockers in the mudroom near their kitchen and I found myself reaching for it multiple times a day. So quick and easy to clean up a mess on the floor- especially with toddlers! I finally got around to getting my ow Dyson for the new home from Walmart. It showed up a few weeks ago!! I leave mine in the closet off our kitchen on it’s charging hook and like expected, I find myself reaching for it several times a day. (Especially with all the glitter and tree flocking that come with ornaments and Christmas!). If you’re looking for a unique and functional gift this is it!! I don’t think a lot people give vacuums so it would be unexpected but something that the person you’re giving it to will wonder how they lived without it. I know I felt that way! Have any of you tried it? Also I’m linking my Instant Pot too because if you haven’t tried one yet I’m about to change your life even more (and save you a lot of time and effort ;). But seriously. Brought to you by Walmart. I love this dyson and you looks soo beautiful!!! The Dyson is a game changer!! Its on my favorite things list. These items will definitely be a great gift idea … love ♥️it! I was just joking with my husband that I knew I was getting old because this is what I put on my Christmas list! And I actually already know he got it for me because there was a deal on Cyber Monday for the V6! 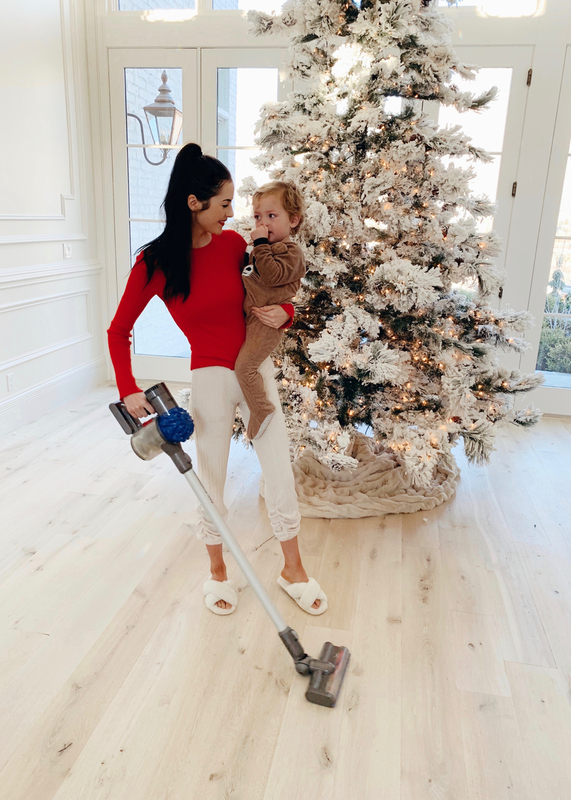 Now that we have a baby, the house just gets dirty and I hate the idea of him doing tummy time or eventually crawling and the ground being nasty – I can’t wait to start using it, so glad to hear you love yours! My Fiancé has been wanting a Dyson so bad, I simply cannot just think of splurging on a vacuum. However, now that I know that they are cordless, this changes my mind. There’s so many versions, I wouldn’t know which one to buy! (We have 2 dogs so any recommendations would be great and maybe for hardwood floors as well). Getting someone a VACUUM cleaner is not something I would have thought of, but it is an interesting and practical gift idea. Thanks for sharing. Ummm yes please! I need this! I feel like my vacuum is MASSIVE! I’m looking for a new vacuum to gift my parents this Christmas so I saw this post I click immediately! It’s exactly what I need. Thank you for sharing! Hi there. Your home is gorgeous. Can you tell what brand/color your wood floors are? We are days aWay froM picking new wood flooring and yours are exaxtly what we have pictured in our heads. Thank you! 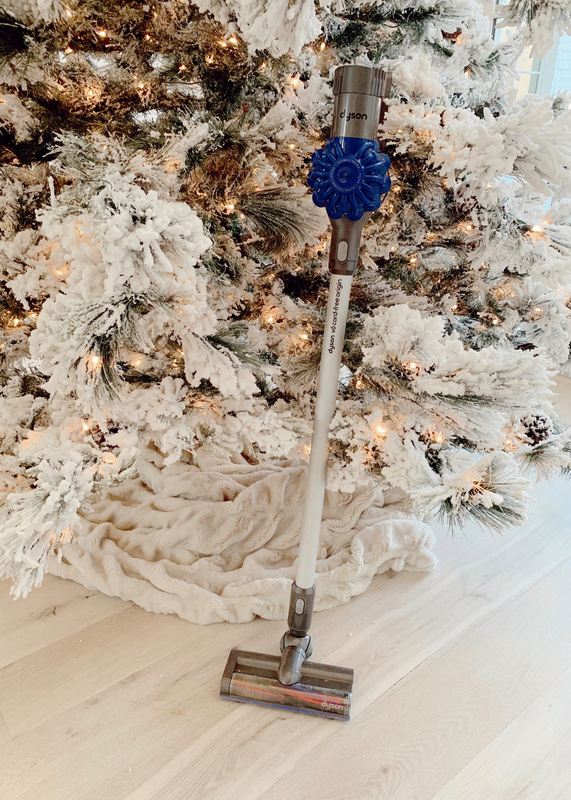 my hubby purchased THE v8 this for me for Christmas because he kept hearing me talk about it and I loved it….are you changing THE head from wooden floor to the rug one ? or are you just keeping the same head on ? hello there! can you share please the brand and color of your wood floor? it is beautiful and airy and classy! Thank you! ?